When it comes to your business or storefront, the exterior sign is your business’s real first impression. The difference between a high-quality, professional sign versus a shoddy, unappealing sign can make or break your business’s bottom line. Especially if you own a restaurant, bank, or customer-oriented business that requires making customers feel comfortable and taken care of, the right sign matters. Because of the outsized role an exterior sign can play to your business’s success, it’s worth taking the time — from the beginning — to design the best sign for your business. The CNC sign making team at Total Sign Solutions compiled this helpful resource that outlines three of the most important qualities that make a good exterior sign. For help conceptualizing the best sign for your storefront, contact the helpful CNC sign making team today. Notice that this tip says “compelling” and not “bright.” While bright signage might work for some businesses — think sports bars, arcades, or concert venues — a bright sign might be the worst choice for a bank, doctor’s office, or construction contractor. So, instead of relying on the misconception that “bright” means “better,” we want to focus on what “compelling” means. When a sign is compelling, it is recognizable and connects to the business’s brand identity. McDonald’s iconic yellow is compelling just as Coke’s red is recognizable from a mile away. Using colors from your existing logo can be a great place to start. Take caution when choosing a trendy color, assuming it’ll help you connect to young audiences. While mustard yellow might be the color du jour, it can just as easily be portrayed as tacky in a few months. Instead, rely on tried-and-true primary colors when it comes to CNC sign making. A compelling sign is only effective if it’s readable. It does no good to attract a customer, only to have them wonder what on Earth your business does or what it’s called. To achieve a visible, clear sign, contrasting colors is the name of the game. When you embark on the CNC sign making process, be sure to choose a different color for the text and graphic (generally your business name and logo) versus the background color. Choosing opposing colors on the color wheel is a great strategy here (such as blue and orange), as the colors contrast but also don’t become an eyesore. If you work with a CNC sign making company, the staff members will pull from years of experience to determine what colors work. Additionally, adding a contrasting outline for the text promotes readability. Whether it’s a border or drop shadow, these stylistic effects can bolster a weak color combination. While you don’t need an exterior sign the size of a billboard, the bigger is still the better. That’s because the bigger the sign, the easier it is to read. Before you design your sign, take a potential customer’s perspective into account. Will they see the sign from a roadway? Will they see it from across a shopping mall parking lot? Will they only see it once they turn into the parking lot? Answering these questions will help you determine how big your exterior sign should be for effectiveness. 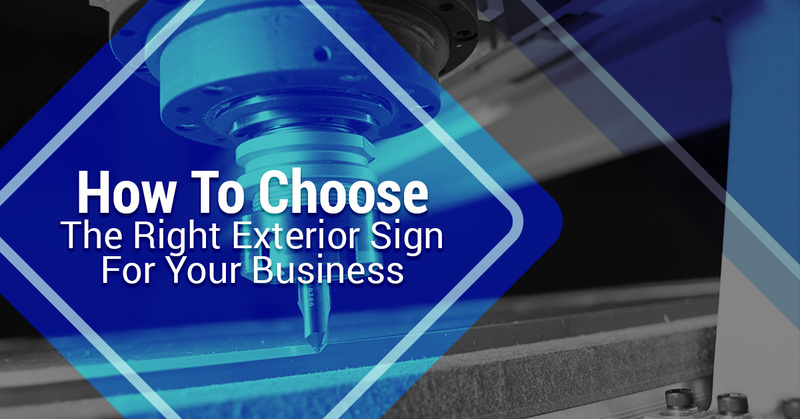 If you’re in the market for a new exterior sign for your business, Total Sign Solutions is your Top Rated Local® national CNC routing and sign making company. When you work with Total Sign Solutions, you benefit from more than a decade of experience. Our CNC sign making team not only knows how to engineer a great sign, but also how to work with customers from the beginning. Whether you already have a graphic in mind or need help conceptualizing of the perfect exterior sign, our team can help. Contact us today to learn more about our CNC sign making services!